My friend Ben Reed, a fellow small group pastor (Grace Community Church in Clarksville, Tennessee), writer, and the Small Groups Network marketing director, sent me an email earlier today that contains a letter from Rick Warren to his church staff at Saddleback Church and an interview Warren did in response to some misinformation about him and Saddleback. I thought it was worth sharing here. 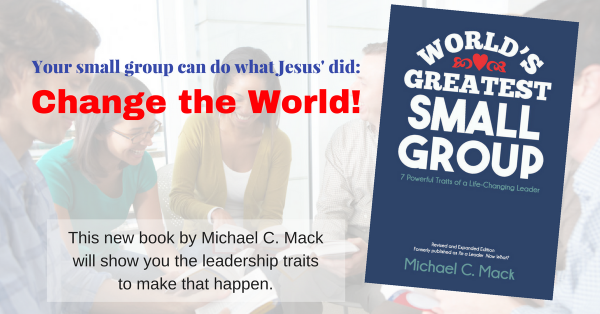 One of the things I hope you will notice is how Warren discusses the evangelistic role of small groups. Good stuff. A few days ago, an article appeared in the Orange County Register that included some outrageous statements about Saddleback that were incorrect. Of course, the media rarely gets everything right, and there’s no way we could respond to every false statement made about us. But I felt this article created so many misperceptions that I agreed to do an interview in response. Here is it below. Please read it all, then forward it to everyone you know would be interested. WARREN: Sure. All three of those statements are flat out wrong. Those statements were made by a reporter, not by me. I did not say them … I do not believe them… I completely disagree with them … and no one even talked to me about that article! So let me address each one individually: First, as I’ve already said, Christians have a fundamentally different view of God than Muslims. We worship Jesus as God. Muslims don’t. Our God is Jesus, not Allah. Colossians 2:9 “For in Christ dwells all the fullness of the Godhead bodily.” Second, while we urge our members to build friendships with everyone in our community, including Muslims and other faiths, (“Love your neighbor as yourself”), our church has never had any partnership with a mosque. Friendship and partnership are two very different levels of commitment. Some of our members have hosted a Bible study with Muslim friends, which I applaud, but I’ve never been to it, and a Bible study certainly isn’t any kind of partnership or merger! It’s just crazy that a simple Bible Study where people explore Scripture with non-Christians would be reported as a partnership and others would interpret that as a plan for a new compromised religion. Just crazy! Third, as both an Evangelical and as an evangelist, anyone who knows me and my 40 year track record of ministry knows that I would never agree to “not evangelizing” anyone! I am commanded by my Savior to share the Good News with all people everywhere, all the time, in every way possible! Anyone who’s heard me teach knows that my heart beats for bringing others to Jesus. WARREN: Based on Jesus’ instructions in Acts 1:8, we practice the PEACE Plan in three dimensions: PERSONALPEACE – my ministry to those closest to me; LOCAL PEACE –our congregation’s ministry to our community; andGLOBAL PEACE – serving other local churches around the world as those congregations do their own local PEACE. The PEACE Center is the building on our church campus that houses about three dozen of our 300 ministries to the community. It offers our food bank, job training, family counseling, legal aid, car repair, tutoring, English as a second language, legal immigration assistance, and many other ministries. This is an example of why I always doubt what I read in newspapers and blogs about ministries. Secular reporters trying to cover churches and theological issues often get it wrong. But then Christian bloggers, instead of contacting the ministry, blindly believe, quote and repost the errors made by secular reporters. Then those errors become permanent, searchable, and global on the Internet. I couldn’t count the number of times a secular reporter has gotten a story about Saddleback wrong but then it is perpetuated by Christians who never fact-check. And the three factors I mentioned about the Internet make it impossible to correct all the misperceptions, and outright lies that get repeated over and over. WARREN: At last count, I heard we speak 76 languages in our church family. One of our 10 values, the “A” in our S.A.D.D.L.E.B.A.C.K. strategy, is that we are an ALL-nation congregation. We are a multi-ethnic church. We want our congregation to look like heaven will look – with every age, race, tribe, and economic background represented. WARREN: To know Christ and make Him known! To live out Jesus’ Great Commandment and Great Commission! In fact, this has been the motto of Saddleback Church since we started it in 1980: “A great commitment to the Great Commandment and the Great Commission will grow a great church.” Everything we do comes out of these two great texts. God’s five eternal purposes for both our lives and the church proceed from these verses. The Purpose Driven Church and The Purpose Driven Life explain this in detail. QUESTION: Through the PEACE Plan, Saddleback became the first local congregation in 2000 years of Christian history to send its members to literally “every nation” as Jesus commanded. WARREN: By taking Jesus’ command seriously. When Jesus said, “Go to EVERY nation” we asked ourselves as a church family, “Has any local church in 2000 years ever actually done that? If not, why don’t we be the first!” So we set a goal to send our members to every nation of the world to do the five tasks of the P.E.A.C.E. Plan by the end of 2010. Of course I know that the Greek ta ethne refers to people groups or tribes not political nations, but you have to start somewhere! So we decided that we would send our members on mission to all 197 nations in the world. (There are 195 nations in the United Nations. The only two nations not in the United Nations are Taiwan and Serbia.) On November 18, 2010, a Saddleback team went to the last nation, #197, a small island in the Caribbean called, St. Kitts. Now, our goal for the next decade, which we call our Decade of Destiny is to mobilize a network of churches who will commit to planting new churches in the final 3,600 unengaged people groups that still do not have a Christian church. QUESTION: How many members did you send out to complete your church’s goal of taking the gospel to every nation? WARREN: 15,867 members were sent out. Of course, we’ve gone way past that in the last year. WARREN: Within a year from this Easter, we intend to plant new churches in 12 strategic cities around the world as resource centers and base camps for the greater goal of planting churches in the 3600 unengaged people groups. QUESTION: What are those 12 cities? WARREN: Tokyo, Berlin, Johannesburg, Bangalore, Buenos Aires, Hong Kong, London, Freetown, Moscow, Mexico City, Amman, and Manila. Anyone who’d like to be a part of the team should contact me atPastorRick@saddleback.com or on Twitter, Facebook, or LinkedIn. WARREN: Of course not. It’s the lie that won’t die. No matter how many times we refute it and correct that lie, people keep passing it on as truth. Jesus is the only way to salvation. Period. If I didn’t believe that, I’d get into a much easier line of work! But I do believe that everybody needs Jesus and I am willing to put up with false statements and misunderstandings in order to get the Gospel out. QUESTION: What are your greatest frustrations about evangelism? WARREN: Reach one more for Jesus! Anyone who’s read Purpose Driven Life knows those were my father’s last words and deathbed instructions to me. It is the theme of my life and I invite you to make it yours. Nothing is more important than the eternal destiny of those around us. This message was sent from Small Group Network located at 1 Saddleback Parkway, Lake Forest, CA 92630. Click here if you wish to stop receiving messages from Small Group Network.